"Just when you thought it was safe to go back to the airwaves..."
Were YOU Off the Deep End? How would you best describe your level of fandom at the time "Smells Like Nirvana" came out? I didn't first discover Al until way after that song. That was my first exposure to Weird Al. I already knew of Al, but I wasn't really a "fan" just yet. I was an Al fan in the '80s, but I kinda grew out of it by 1992. Are you kidding? I was already a die-hard fan at that point! By 1992, most of the public had forgotten about Weird Al. It had been three years since his last major project, UHF, and it seemed as if Al had simply faded into obscurity after the film's disappointing box office performance. But little did everyone know that Al was coming back with a vengeance. Consider the gap of time here: 1989 to 1992. Just three years go by and everyone thought Al's career was over. Al has since taken longer breaks between albums, but he's been able to keep his face in the public via appearances on slapped-together cable television specials. Perhaps if such programming existed fourteen years ago, Al wouldn't have become a distant memory for many. Pop culture was changing in the spring of 1992. Grunge music was hot, Wayne's World was a hit, and the question on everyone's lips was "Who should succeed Carson, Leno or Letterman?" For Al to stand out in all this, he would have to target one of the era's biggest icons...and that's just what he did. Released April 14, the lead single from Off The Deep End took aim at the alternative scene's poster boys, Nirvana. Based on the group's genre-defining hit "Smells Like Teen Spirit," Al's parody "Smells Like Nirvana" poked fun at all aspects of grunge, from its loud, unintelligible lyrics to its unofficial hometown Seattle. While not necessarily a scathing satire, "SLN" showed that Al wasn't afraid of tackling whatever new trend pop music threw at him. And, as been often repeated in the press, Nirvana finally felt they had "made it" when they heard their own Weird Al parody. 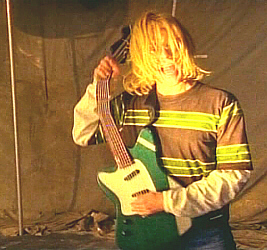 The "Smells Like Nirvana" video was heavily rotated on MTV and would end up earning Al his first MTV Video Music Award nomination. Weird Al was back. As was the case of "Eat It" eight years before, the success of "SLN" and the album were helped in large part by the single's music video. With a simultaneous world premiere on such networks as MTV and Comedy Central, the video was an almost shot-for-shot parody of Nirvana's original video. Filled with visual gags, a celebrity cameo, slapstick, and even girl scout abuse, "SLN" set a new standard for Al's parody videos, and it remains one of his most consistent and most hilarious. Al has been saying lately that as far as parodies are concerned, his albums are like time capsules, highlighting whatever was hip and trendy since the previous album. That was definitely true with Off The Deep End, as in addition to "SLN" it featured parodies that reflected the evolving music scene at the cusp of the decades. Two "Al firsts" are featured, his first rap parody ("I Can't Watch This") and his first boy-band parody ("The White Stuff"). Late-80s pop is also touched upon via the controversial Milli Vanilli ("The Plumbing Song"), while Gerardo provides Al with his first foray into Latino music ("Taco Grande"). With the "SLN" video heavily played on MTV, and with a new Al-TV special at the end of April, Al was back in the spotlight with a hit album. Off The Deep End would reach #17 on Billboard's Top 200 album chart (tying with In 3-D for Al's then-alltime high), "Smells Like Nirvana" would hit #35 on the "Hot 100" singles chart, the video would be named one of the one hundred greatest of all time by Rolling Stone, Al would receive his first MTV Video Music Award nomination, and the album would go Gold and receive a Grammy nomination. The phenomenal success of "SLN" was so great that Al boldly chose to release an original song as the album's second single. Promoted with a video that eerily mimics that of Extreme's "More Than Words," "You Don't Love Me Anymore" would become one of Al's more-popular originals. It would also be one of his last original songs to get this kind of attention. Off The Deep End was doing well internationally as well. In the United Kingdom the video became a hit, and the single was even released as a 45! And in Canada the success of the album led to Al doing an Al-TV-esque special for the country's music video channel MuchMusic. Called AlMusic, it proved to be so popular that it started a loving relationship between Al and the network that would last for the rest of the decade. Al's Canadian fanbase would become so large that the country would soon get its own tour and almost every one of Al's albums would go Gold or Platinum there (including the compilations!). The summer of 1992 also saw the release of Al's first-ever music video compilation. Although 1985's direct-to-video The Compleat Al had the videos interlaced within the movie, this was his first official stand-alone video compilation. Titled The "Weird Al" Yankovic Video Library: His Greatest Hits, the release collected all of Al's videos at that point (with the sole exceptions of the two related to UHF). It would soon go Gold, Al's first such accolade for a video release, and would even prompt a number of follow-up releases. And through all this, Al was already brainstorming ideas for his next album, Alapalooza, released in late-1993. Scotti Bros. was also making sure to keep Al in the public eye, releasing a food song compilation that same year and a TV song compilation in 1995, not to mention a massive four-disc boxed set in 1994. Whether or not it was a concentrated effort to not let Al's newfound success cool off remains unknown. But still, the message was clear: Weird Al was back, and he wasn't going away! Go back to the main Silver Accordion page!